Our daughter is allergic to raw A1 milk protein. On contact with her skin she break out in hives. On consumption she coughs, vomits and has swelling of the eyes and face. This happens when drinking ordinary fresh milk or products containing fresh milk such as ice cream and cream. Thankfully she hasn't and hopefully never will experience a life threatening allergic anaphylactic shock. It took us until she was about 18 months old before we discovered what was causing the problem. Looking back it was easy to narrow the culprit for her reactions down to ordinary milk. 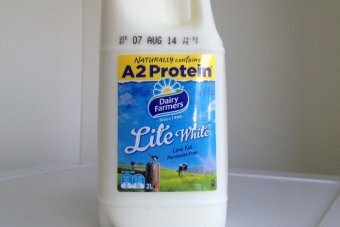 My epiphany was when I remembered half seeing a story on the ABC some years ago about how a protein in ordinary milk, A1, can cause unfavorable reactions in a small percentage of the population and that it was different from lactose intolerance. There had been a company setup supplying milk from a genetically isolated heard that only produces milk without the A1 protien. So decided to do an experiment to test this theory with our daughter. Our daughter has a skin reaction sensitivity. Its easy to obtain samples of milk containing A1 and A2 protein ("ordinary" milk) and another of A2 only milk from the local supermarket. The test involved placing a drop of one sample on one hand, and a drop of the other sample on the other. Sure enough, the sample containing A1 protein caused an almost immediate welt on that hand. Of course I immediately washed the sample off that hand. The hand that I applied the A2 sample to had no reaction. From that point on we have switched our milk consumption to A2 only milk. Ever since, other than a couple of accidental contamination do to misleading product labeling, we've not had a single problem consuming A2 only milk and cream products. This brings me to the point of this post, Dairy Farmers misleading "Naturally Contains A2 protein" product labeling. While accurate in its claim, it is misleading as the reason people buy A2 milk is the absence of A1 protein that causes the problems. The labeling has caused more than one mishap in our household where one of us parents or visiting grandparents have grabbed the wrong product from the supermarket shelves mistakenly believing they were doing the right thing. Can you imagine the surprise when your 18 month old baby begins to choke, cough and vomit for apparently no reason and then the subsequent blame and guilt response? I don't know if we've got the science right or not, this is only our experience, but now we are extremely careful with our dairy supply and we've had far less problems with upsetting reactions as a result. The good news is, most children suffering from milk allergy grow out of it by age 3-4. I'll see how we go and repeat this test again in the future. 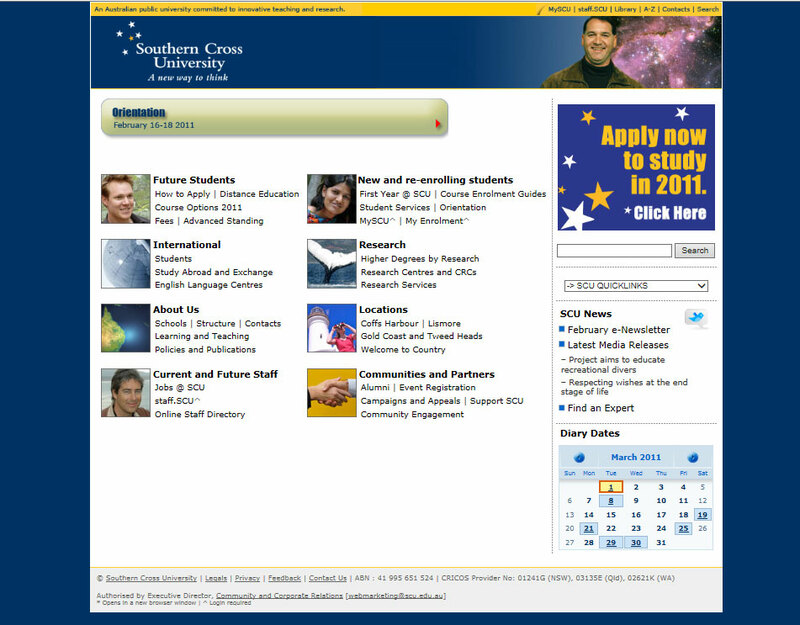 In 2011 I was recruited to Southern Cross University (SCU) as their Web Content Editor with responsibility for the public facing websites. 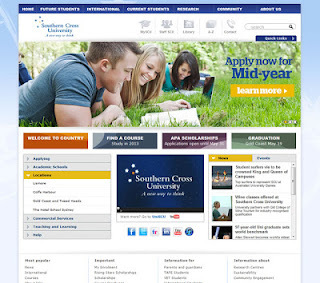 The first task assigned to me with great urgency was to refresh the SCU website and enhance the user experience. My strategy was to conduct expert analysis on the website, conduct stakeholder engagement activities, conduct a user survey to guide design direction, review Information Architecture (IA) and navigation, develop initial design wire-frames, develop the web design with graphic designer, conduct user and accessibility testing of designs, prototypes and development websites. Then to launch, review and repeat. I soon discovered in meeting with ICT that the major impediment to the redesign project would be the limitations of the dated in-house web Content Management System (CMS) Websys. Websys would turn out to be an extra challenging dimension to this project and the rest of my time at SCU. Early on I engaged Peak Usability to assist with conducting a website user intercept survey which would be used to guide the development of the proposed new home page and school site designs and information architecture. I also brought in Cool Planet Design, a graphic designer with extensive experience designing university websites, to assist turning my concept wire-frames and mock-ups into something closer to the final designs. These were then made into prototype websites which I demonstrated at stakeholder engagement and testing sessions, feedback from which was further incorporated into the designs. Peak Usability was again engaged to provide expert review of the resulting designs and IA at this stage. Early on we also began running into the limitations of Websys CMS and began the numerous fixes, work-arounds and compromises we’d have to make in order to progress our designs. For example, to conduct a simple site-wide update of the corporate logo would normally require a simple global image replacement process. With Websys it turned out this would require many hours of developer time manually updating each of the many non-standard templates assets that were used to build each of the child sites. While many of the child website templates appeared to be nearly identical, each was a unique version of the main template. To complicate issues further templates included varying levels of embedded inline code that was incompatible with the global code and code libraries. It also turned out that parts of Websys itself included embedded inline code that would need to be removed. I decided on a strategy to have Websys to be fixed to a reasonable standard, create a new master template and progressively review existing content and migrate across into new sites based on these new templates in the improved Websys CMS. The child templates would inherited properties from the parent master template and therefore make global changes much more efficient. We would also use a system of code snippets to further customise specific design elements such as local navigation and local colour schemes. This strategy required buy-in from project sponsors so my task was to convince them that this was the correct course of action for the immediate redesign project and the longer term management and stability of the SCU website assets. At this point the possibility of upgrading to a different CMS was floated and rejected. Either way, it would be a much more complex and time consuming process to redesign and relaunch the SCU website than initially expected. In October 2011 to ensure our compliance with the Australian and New South Wales government’s mandate for all government websites, including universities, to comply with the WW3.org recommended WCAG 2.0 Accessibility standards I engaged Vision Australia to conduct an Accessibility Assessment on our development websites. As a result we were able to incorporate most of the required changes before launch and continue to improve our processes to ensure compliance before and after the compliance deadline. Prior to roll-out I conducted a round of engagement with stakeholders to review the designs, gather feedback and provide rational for various design decisions. 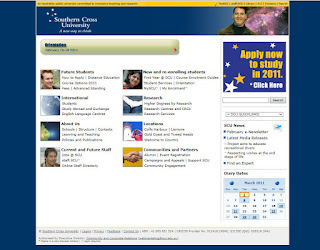 The initial redesign roll-out including the SCU home page and top level pages and sites began in December 2011. As part of the launch strategy I arranged for the inclusion of Google Analytics tracking code into the new website templates. Up to this point, surprisingly considering I had setup Analytics at NC TAFE in 2006, I had only been successful in having Analytics installed on the SCU home page. This would prove to be a major advancement from using server log files to report on web traffic to tracking user behavior at SCU. As part of this strategy I had Analytics setup to generate custom monthly reports for Marketing and Recruitment and other stakeholders. The progressive rollout of new design for all associated sites continued for most of 2012. The maintenance strategy has been to conduct development sprints to incorporate feedback and results of further testing into regular minor monthly or major quarterly iterations for navigation and design improvements. Other functions of my role at SCU included procuring content and managing the SCU on iTunesU, UniSCU YouTube channels, monitor and provide advice on the operation and administration of official Twitter and Facebook accounts and reviewing and developing policies and procedures relating to social media at SCU. Thinking of creating a selfie video competition or promotional campaign strategy? Try YouTube. Self shot video campaign - YouTube account setup, uploading and sharing. I was asked recently for advice on how we could setup a system for International students studying at Southern Cross University (SCU) to be able to submit their own video message "I am not Australian … but I have an Australia story" as part of our Fusion Festival. Several issues crossed my mind immediately including copyright, privacy and content hosting an processing resources. Receiving, processing, hosting, vetting for copyright, legal issues and inappropriate content for this kind of thing is not something I am resourced for. So, having had similar requests in the past and knowing there would be more to come I devised a plan to have YouTube do all the heavy lifting for us and allowing SCU International to do all the viewing and choosing of content to be embedded on our website at the end of the process. I'm sharing this for anyone else who is thinking of doing something similar on their website. There are so many Selfie competitions currently, selfie video competitions are getting pretty popular too. This is one approach to achieving a good system. I chose YouTube above other video hosting options for several reasons including cost - free for all parties, service - no servers or storage to manage, reliability - serious up time no hassles, legal responsibilities - its between the uploader and YouTube. All that is required is the submitter, once their video is uploaded to YouTube - YouTube does all the format processing for us, they then need to email SCU International the link to their video provided by YouTube . International then views the video and obtains the embed code for our website directly from YouTube page for that video. We then seamlessly embed the video into our webpages as required. So much simpler than what would be required to process and host ourselves. Basically I've gone through the YouTube signup, uploading and sharing instruction pages to provide a summary of the appropriate information for participants for this purpose that you can use below. Note I’ve included highlighted in red and bold where you need to insert the email address that you want people to send their videos to and campaign message you are trying to promote. Furthermore, you might suggest they append the their name and your campaign/competition phrase to the title of their video. When people start submitting videos to this email address it may not be obvious who, what , where or why these are coming to you. Its may even appear to be spam or directed to junk mail. What ever email address is chosen and whoever is monitoring it, it would be wise to add service@youtube.com to their address book and filter exception list to ensure all submissions are received. This is a brief summary of the actions required to upload and share your video with Acme Corporation and our customers and fans. Starting on the YouTube home page https://www.youtube.com/ take the following steps to create an account. Note, this will setup a Google Account. Once you're done setting up your Google Account, click Back to YouTube. Select the video you'd like to upload from your computer. You can also record a video from your webcam. As the video is uploading, you can add information (e.g. title, description, tags), change your privacy settings. Please include in the video title your name followed by the phrase Acme Corporation campaign message. Make any changes you want to the video settings and information, then click Publish to finish uploading it on YouTube. You can always publish your video at a later time in your Video Manager. If you set the video privacy setting to Private or Unlisted, just click Done to finish the upload or click Share to privately share your video. Once the upload is completed YouTube will send you an email to notify you that your video is done uploading and processing. You can then forward that email to Acme Corporation email for easy sharing. If you prefer not to receive notification, you can opt out by visiting your email settings. Share this video: This gives you a link that you can copy and paste into an email message to Acme Corporation email. Email: Enter Acme Corporation email into the “Email addresses” field and a note if you wish then click the “Send email” button. YouTube will send an email to the email address(es) you enter. For entries to be valid please include the your name and the Acme Corporation Campaign message in the title of the video. I'll let you know how successful this strategy is. I hope your campaign goes viral! So I was walking Ms8Months in the pram along the shared public walking/cycle path near Light-House beach, Ballina yesterday afternoon when I saw an American Pit Bull Terrier coming towards us off the leash. On its trajectory along the path it was already making for between us and the road on our right with the bush to our left leaving very little option to avoid a very close and uncomfortable proximity and no means of escape should I choose to make such a futile an effort. I immediately stopped pulling as far to the left as the railing would allow attempting to bring as little attention as possible to our existence. This was after earlier pointing out to a 40 something man who was walking around the beach carpark with his cattle dog off leash next to the "no dogs" sign that his dog should at least be leashed. His response was "Why, are there council rangers around?" assuming I was concerned he would get in trouble. I corrected him explaining my concern for the safety of children, particularly my baby daughter to which he responded "oh, no, this is such a beautiful, gentle dog". My response to this was the usual "thats what they all say" as he proceeded to wander off towards the beach, dog still unleashed. The day before, Saturday, while Kirsty was surfing I was about to take Ms8Months down to the small paddle pool on the reef at Shelly Beach when I noticed a Jack Russell dog swimming in it. I don't know whether the other parents standing around with their children were concerned but none of the children were in the pool while the dog was in there. Call me a snob but there was no way Ms8Months was going in that pool until after high tide had flushed it out. It got me wondering how many dogs paddle in that pool on a daily basis? A man proceeded up the beach, a "no dogs" area, with this dog, wait for it... unleashed. We later came across this same man and dog outside the Shelly beach surf clubso I thought I'd take the opportunity to raise the issue with him. He flat out ignored me and carried on with his business. It is really horrifying what a dog, even a small one, can do to a grown man never mind a child. 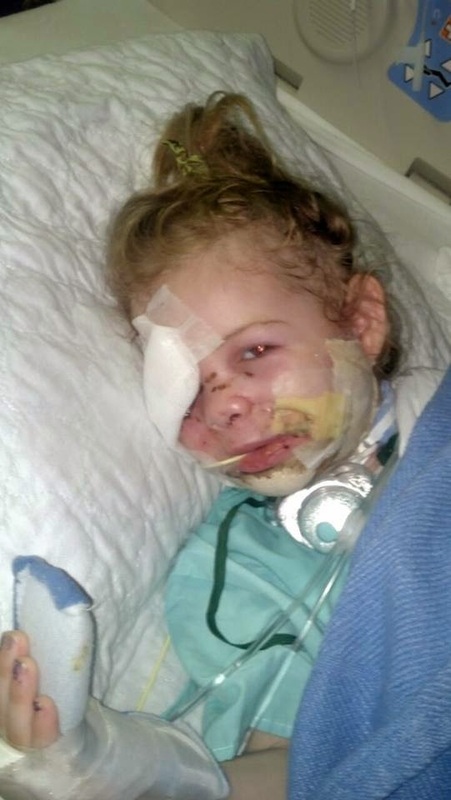 I recently became aware of a young girl, 3 year old dog attack victim Victoria Wilcher, who you may have seen in the news as the girl who was asked to leave a KFC "restaurant" in the US because her facial injuries a the result of a dog attack was upsetting customers. Victoria Wilcher - one of the less confronting photographs of this brave and lucky survivor. "Victoria lost her right eye in an April attack at her grandfather's home in Simpson County. She also received a broken upper and lower jaw, a broken nose, and smashed cheekbones. She also lost the ability to move the right side of her face, according to the post." Follow Victoria's Victories Facebook Page for news on her recovery and medical updates. While in the UK Banned American pit bull terrier dog named Killer mauls baby to death. So, as this pit bull drew closer I became aware of its "owner". I was barely aware of this slight, pierced and tattooed man in his late 20s early 30s dressed in US style basketball singlet, track pants and baseball cap who, in my opinion would have about as much chance controlling this beast as running for Prime Minister had the dog been on the leash anyway. I was wrestling with being prepared for a flight or fight response to protect my 8 month old daughter from a well know baby killer when he said "Ow's it garn blud" as he swaggered past. My fear switched to anger as I watched these two animals saunter past unfettered in provocative disregard to society and safety. About 4:30-45pm on 16th April 2014 my partner was out walking with our 6 month old baby daughter in a pram in our local neighbourhood in Goonellabah when she was attacked, unprovoked and by surprise, from behind by a small dog who bit her on the leg. This dog, breed currently unidentified, injured my partners lower leg with bruising and a puncture wound drawing blood. On receiving a call form my partner, who was upset and a bit shocked I immediately drove from work collected my girls in our car and took them to the excellent Lismore Clinic who agreed to see us after hours to have the wound treated and antibiotics prescribed. Since that day my partner has had many more encounters with dogs while out walking and now carries a big stick. Not much use in surprise attacks like the one previously described. There is at least one dog, some times more, big and small out wondering around each time she takes the pram out in the space of a few blocks approx 2-3km. Its like my partner and daughter are prisoners in our own neighbourhood. I'm sorry, while sharks sometimes attack humans when we venture into their habitat, the statistics show dogs regularly attack and injure humans in our own habitat see the information below from the NSW Government website. In NSW 2012 there were 5 shark attacks on humans reported injuring 3. In the same year there were 3,323 dog attacks on humans, 767 of those required medical treatment and 146 people were hospitalised. 75% of dogs were not under control and 62% occurred in a public place. Neither caused fatalities in NSW that year, however both have been known to, especially the very young and old. In total there have been less than half the number shark attacks reported in Australia since records began in 1791 than dog attacks reported in a single year 2011/2012 reporting period in NSW. I acknowledge its not all dog owners, but come on people, look after your pets. Please be responsible and don't let your pets roam the streets unattended and unrestrained terrorising the community. Its only a matter of time before someone is hositalised or a small child is killed. Forgot to post this vid I shot and edited last year of The Voice Australia Musical Director Scott Aplin for SCU. Enjoy! In the last couple of months we have rolled out some SEO (Search Engine Optimisation) changes across key sub-sites. Our goal being improving the ranking of these sites in Google search results based on keyword searches. Below is the benchmark and current search ranking performance on Google for the School of Environment, Science and Engineering site at Southern Cross University for comparison before and after URL change results. So in this case our SCU website was coming up in 3rd place in the search results. In my analysis, I noticed that Griffith aren't utilising the Description or Keywords metadata fields which we are. All other SEO aspects are reasonably even. This lead me to assume that their advantage is the use keywords in the URL and probably more overall visitor traffic. I concluded that making a similar change to our URL should make us more competitive and improve our ranking. In July 2013 we proceeded to make the following changes to our site loading keywords in the the URL. Of course this transition had to be carefully managed to make sure that all current shortlinks and redirects we diverted to the new URL, that all pages had new redirects placed to catch traffic and send it to the new page locations and that sitemap.xml files were updated and re submitted. We also carried this same process out with our other School sites. So climbing one position in one month is encouraging and demonstrating that the experiment was successful. Of course it will be interesting to compare other likely keyword combinations that prospective students are likely to use and measure their success. Looking at visits to this School home page in Google Analytics we can see that for June the site was received 222 visits, fairly typical in the months leading up to the changes, while in August it has already received 380 visits, an increase of 158 visits or 67%. At this point our strategy has helped the site climb one place in the ranking to second for that particular site and increase overall visits by 67%. Other improvements are a reduced bounce rate meaning that visitors are of a higher quality. In comparing our page to Griffith Uni's there are some more SEO improvements we can make Eg. making in content keywords links to course or discipline pages, though I believe our main obstacle in gaining number 1 ranking is going to be traffic. Traffic is a very powerful metric in SEO ranking and I have the feeling that Griffith Uni is probably getting a lot more traffic to their page at this point. However, the increase that we are already seeing could build up over time and, with a few additional SEO tweaks, eventually give us the edge. Other factors that my benefit our site could include targeted digital campaigns to drive more traffic from other website sources that Google. Conclusion, while not gaining that coveted number 1 ranking at this stage, this exercise resulted in significant improvements. Formerly the Web Content Editor at Southern Cross University, Australia 2011-14. I love to stay current with current and emerging technologies. I thrive on the challenge of solving complex problems and managing change. I have a wealth of experience and expertise in the multimedia and online spaces that are portable to mobile and other technologies. I enjoy working with people and believe I have empathy to help make their daily tasks easier and more successful. I approach everything I do strategically and am able to communicate complex concepts in clear, simple and concise language. I also surf and play in an 80's style rock band RetroVirus.